For the uninitiated, PreSonus Studio One is a serious challenger to the far more established DAWs, built from the ground up to go head-to-head against those in the old guard. 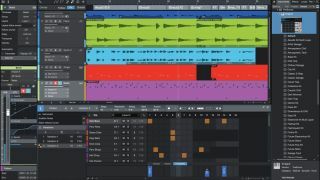 Version 4 saw the addition of several innovative new features to Studio One including the Chord Track (enabling the easy manipulation of chords and progressions within a project), Drum and Pattern sequencers, upgraded Impact and SampleOne instruments, and more. Indeed, it's the 'more' with which we concern ourselves here, as we run through seven of this amazing music production application’s ‘second tier’ improvements. For more on Studio One 4, get hold of the October 2018 edition of Computer Music. Studio One comes in three flavours: the standard-issue Artist version, the free Prime version, and the full-on Professional version, which will net you every new feature. Artist users don’t get to use Chord Tracks, but they do get Drum and Pattern Modes, plus the two new instruments. Of the major new features, Prime users get only Drum and Pattern Modes. With its ability to read and write in AAF format, Studio One 4 helps you translate whole projects - including files, their positions on the timeline, automation and console options - to and from Pro Tools, Logic, Premiere and other DAWs and video editors that support the standard. As a side note, AAF stands for Advanced Authoring Format. It was created by the Advanced Media Workflow Association. We hear those guys can really party! Some features have arrived in the arrange window to make life that little bit easier when working with clips. Activating Ripple Editing (chosen next to the Snap and Autoscroll options) means that moving an audio region will displace whatever you move it onto. In other words, if you have three audio regions, one after the other, and you move the third into the second position, the second will automatically move to the third position, rather than just staying where it was underneath the new audio. This is particularly useful for large-scale song arrangement, among other things. Remove Gaps is a right-click option that's also found in the Event menu. Select as many MIDI and/or audio regions as you want, hit Remove Gaps, and all the events will be nudged up next to each other, with the gaps between them completely filled. There’s a nonchalant-looking Note Color dropdown over the piano roll. This gives you access to three main options: Velocity, Part and Pitch. Back in v3, notes had one colour: the same as that of their host track. Now, that’s become the Part option. The Velocity option colours notes according to their velocity settings, and Pitch - shown above - displays a different colour for each MIDI note. PreSonus worked very closely with Celemony on the first version of ARA (Audio Random Access), bringing Melodyne integration into Studio One a number of years back. This open standard has since seen Melodyne built into Sonar, Samplitude and more. ARA 2 was announced this year, and PreSonus have said that when it comes to fruition, Studio One 4 will support it. The ARA 2 standard is said to offer more integration between DAWs and plugins. Whether it means a whole new plugin standard to compete with VST and AU remains to be seen. Since the MP3 patent expired, the format is available for export in an increasing number of DAWs, and that includes every version of Studio One: Artist, Professional and the free Prime. Templating and importing will be a darn sight easier with this new feature. Go to Song, Import Song Data, and you’ll be asked to select another Studio One project from your hard drive. From there, you’re presented with a list of the elements in that project (tracks and instruments, insert effects, send effects, automation and more), which you can pick and choose between for flying into your currently loaded project. This means no more messing around when you need to bring something you were working on in another track into your current project.